Every once in a while, I am reminded of why I love reading. Reading is something that can connect you to anything as long as you allow your imagination the freedom it needs. What I loved about Christa's Luck is the connection it gave me to my past, bringing back fond memories. This book reminded me of the love I have for horses and the horseback riding I did as a child. It made me want to get back out and become involved with horses once again. 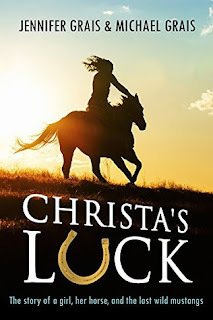 Christa's Luck is a story about a teen girl, her horse, and the wild horses of Nevada. Christa is a 13-year-old girl who has been able to ride a horse since she could walk. She loves riding out on the trails that take her into the nearby forests and mountains. Out there is where the wild mustangs roam free, where there are legends of a Lost Herd – the biggest herd in the area – that no man can catch. Christa loves theses horses, their spirits wild and free, and she would do anything for them. That willingness is soon tested because there are people rounding up the wild mustangs and taking them to unknown places to be sold or slaughtered. Christa and her friends fight to stop the round ups, but soon tragedy strikes and she finds herself banding together with those she has been fighting to save her beloved mustangs. Christa's Luck was truly an inspirational story. It opens your eyes to realities your everyday person wouldn't always think about and it makes you feel like you can do anything if you set your heart and mind to it. The story was inspired by a true horse rescue in the Netherlands several years ago. After watching the video of the rescue, I appreciated even more every word written. Christa is such a strong character, yet still fragile at times. She is a young teen, still trying to find her place in the world, and her beloved horses help her to find that place. She becomes an advocate for the horses, doing everything she possibly can to stop the round ups, and to get the community more aware of what was truly happening. You could see her growing as you read, becoming more confident. Her family and friends were just as important to the story line, giving her the courage she needed to keep going. We can't forget the horses, either. Every single horse comes alive on the page; they are amazing creatures, so strong and proud, and Christa needs them just as much as they need her. You could feel the passion that Christa, her family, friends, and even the whole community felt towards the culling of the wild mustangs. You felt the heart-breaking love Christa had for the horses, tame and free both; you could feel the strong bonds, the connection Christa had with these amazing creatures. The authors knew how to evoke those same emotions in the reader. You found yourself laughing and smiling with Christa, crying when she cried; you could feel every emotion. It takes truly talented writers to get that sort of response from their audience. There were a few consistency issues in this book. Christa saw her first round up on a weekend and went to school on Monday, the next day she was getting up early and riding all day in search of the lost herd, no thought of school. I noticed this time jump or misstep a couple times as I was reading, but this one stood out the most. The imagery the authors created in this book was incredible. I could almost feel the wind whipping through the horses' manes as they ran at break neck paces; I could see the breath-taking beauty of the landscapes Christa and her friends traversed, and even experience the wildness of the storms that threatened everything they held dear. Christa's Luck makes the reader become aware of the hardships and even the beauty of the horses still running wild today, all over the world. It makes them want to do their own research on the subject, to see what they can do to help in any way they can. It made me realize that I don't want to see the end of these incredible, beautiful, free animals. One Last Thought: Other than a few grammatical errors - missing quotations marks - and the inconsistencies mentioned earlier, this book was very well written and edited. Favorite Thing About the Book: I loved the relationships Christa developed with her horses. You could really feel the love she has for all of them. First Sentence: Looking back, I could have never known how the Lost Herd would change my life forever. Inspired by a real horse rescue, Christa’s Luck is a teen fiction novel about Christa’s love for an endangered herd of wild horses and how her special connection with them inspires her to look beyond her own unforgivable mistakes and try again. She rises up to become a horse advocate at fourteen, whose passion and heart move an entire town to take action. In the vein of The Horse Whisperer and the Black Stallion, Christa’s Luck is an epic adventure story of courage, friendship and freedom. Author Links: Website, and there's two websites they suggest for information on the wild horse issue: Return to Freedom and Love Wild Horses. Jennifer Grais is a singer-songwriter who recorded several albums in Los Angeles and Nashville and toured as Jackson Browne’s background singer. When she met Michael and they moved to the rural area of Topanga Canyon, CA, her childhood passion for horses was rekindled. She completed a year-long program of study with Linda Kohanov, best-selling author of “The Tao of Equus”, and “Riding Between the Worlds,” and began exploring a deeper relationship with horses. In December 2006, she was captivated by footage of a horse rescue that took place during a flood in the Netherlands at the hands of women riders. The drama of the rescue inspired the novel, “Christa’s Luck,” a young adult novel co-authored by Michael Grais. Research for the novel exposed Jennifer to the unfolding drama of the wild mustangs in the western United States and became the primary plot of the book. Read more about Jennifer and the inspirations behind Christa’s Luck. Michael Grais has written and produced movies of domestic and international acclaim including Death Hunt, Poltergeist, Poltergeist II, Marked for Death and Cool World and more. Michael has also contributed to the book Why We Write and has taught filmmaking at University of New Mexico and in various workshops abroad. After attending New York University’s Film School and Emerson College, he earned his MFA in Creative Writing from the University of Oregon. Read more about Michael Grais. Michael and Jennifer currently live in Northern California with their horse, Solo and two cats Francesca and Finnegan. For more information about the wild horse issue in America, please read Return to Freedom and Love Wild Horses. We have one copy of Christa's Luck to give away to our readers. This giveaway is open to residents of the US. You must be 13+ years of age to win. If you're under 18, you must have parental permission to enter. Reading Lark is not responsible for lost or damaged packages. The book will be shipped by the authors. The giveaway runs from August 25 - September 1. Winner will be notified via email on September 2. EXCELLENT review! You have such a gift for writing and I hope you continue it! I always enjoy coming back to your blog and reading your thoughts :) I hope to see you around my blog today and let me know your thoughts on today's post! Thank you so much for the beautiful review. We are so glad you enjoyed Christa's Luck! Wow! This is a powerful blog post that says so much about this story...I don't usually pick up YA books where the protagonist is so young (it seems like 13-14 year-olds can come out reading a little more like middle-grade books than young adult, even if the writing/vocabulary is more technically complex) but this sounds like the authors took a character and made her strong and active enough for anyone to enjoy. The true story behind this book is so incredible ... I can see why the author would be inspired to write this book!